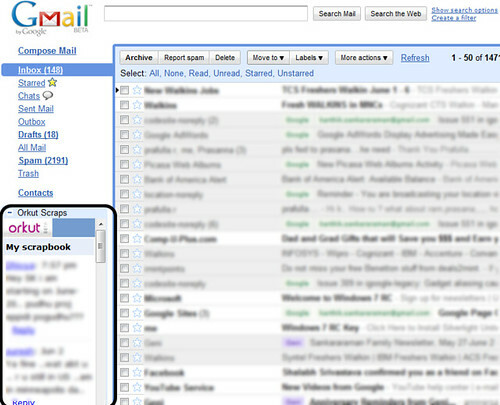 (Please also read the updated post for viewing orkut in Gmail in Full view ). As I mentioned in my previous post, we can add any google gadget to our GMail page. Let us add Your Orkut Scrapbook to GMail. 1. Go to Labs in gmail. 2. In Labs tab, under Gmail Settings, Enable “Add any gadget by URL” feature, Save changes. 3. Now Go to the Gadgets tab in GMail settings. Muito bom, procurei por algum tempo esse gadget, parabéns. Nice , that is a thing which everyone should know.i wonder why google let its feature to hide so much and let bloggers like you to find and tell to the whole world….